‘Core’ strengthening is always a popular topic so figured I’d highlight another set of exercises that we use here at Elite Physical Therapy and Sports Performance. I’ve been playing around with the Bunke planks for awhile now as part of the discharge criteria for my runners and other select athletes. It’s just one more way to gauge symmetry and in this case its looking at stability through the fascial lines of the body. My only problem has been that the tests can be too difficult for larger athletes, older patients, and those with shoulder dysfunction so I needed to regress these planks a bit to allow all my athletes and patients a safer place to start and to give them a shot at being successful. The hamstring planks can be modified by putting the forearms on a bench with the feet on the floor and then running through the progressions above. If the shoulders are the problem, then we typically have to go to lying supine with feet up on a box or ball. If you have any questions or want to get tested as part of our Annual Musculoskeletal Exam, just email joe@elitepttc.com or give us a call at 231 421-5805. This entry was posted in Uncategorized and tagged back pain physical therapy traverse city, core strength, CrossFit Traverse City, low back pain traverse city, physical therapy running, sports performance traverse city on October 14, 2015 by Joe Heiler. I recently interviewed Todd Nief, a CrossFit coach from SouthLoop Strength and Conditioning in Chicago. It’s posted over at SportsRehabExpert.com on a free page here: http://www.sportsrehabexpert.com/public/931.cfm?sd=2. If you’re into CrossFit, or even just thinking about it, you’ll definitely pick up some good tips from Todd. Teaching the Olympic Lifts, power lifts like the squat and deadlift, and kettlebell lifts are some of the things I enjoy the most about my job. Unfortunately I also see a lot of athletes, and adults, that get injured performing them. I don’t know that most people understand how complex these lifts can be, and how easily things can go wrong. So whether you want to incorporate these lifts into your program, or need to recover from injury and get back into hard training, there is no better place to go than Elite Physical Therapy and Sports Performance. Learn to do these movement correctly and you’ll see some great results! 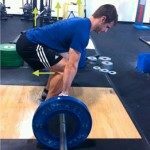 This entry was posted in Uncategorized and tagged CrossFit Traverse City, low back pain traverse city, physical therapy traverse city, shoulder physical therapy, sports performance traverse city, sports physical therapy traverse city on July 25, 2014 by Joe Heiler.